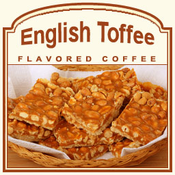 English Toffee is a classic coffee with creamy caramel undertones, swirls of sweet vanilla, and of course, rich butterscotch flavors. With flavors of subtly roasted almonds complementing each and every sip you take, your taste buds will rejoice over this smooth, velveteen English Toffee flavored coffee creation. Since only 2 calories are in this decadent after-dinner coffee, you can indulge in it as much as you like � worry free. 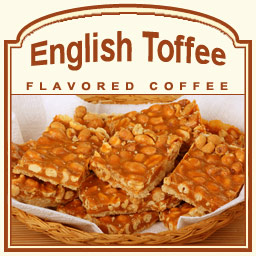 Made with 100% authentic Arabica beans, your English Toffee flavored coffee will make your mouth water from its candy-coated, buttery sweetness combined with delicious coffee. Roasted and shipped on the same day, this English Toffee will arrive in a heat-sealed valve bag to ensure quality and freshness. For anyone that loves rich toffee, this collaboration of creamy and buttery in the English Toffee flavored coffee will melt your taste buds into a blissful state of sweetness.